We intentionally create our lives through emotion, which in turn, directly allows us to manifest accordingly via our thoughts as The Law of Attraction promises. Lunar energy from above is astrologically in charge of how the messages of our human emotions play out in precise timing. We are always offered the chance to evolve and align down here below, yet equally we must remember we energetically cannot solve everything we may need to in our lives all at once. As we become deeply aware of what we are feeling in our lives -when we move away from fear and tune in to our source that knows it is a vibrational and expanding being- we have leverage, control and clarity to move through what the contrast of our lives may be bringing towards us. If we choose resistance to what is, our thoughts only block what is meant to be inspiring us. Thus, we miss our opportunities, neglect to heal and recharge, surely keeping us in a downward spiral we feel no control within. Ask yourself this question. Why do I ever feel stuck or dissatisfied? Answer. If you are not tuned into your feelings, your thoughts naturally are not focused and intentionally aligned with your desires. Negative emotions will only continue to point out what it is that you do not want if you are not coming from the feeling energy of expansion and choosing to be a deliberate creator. To naturally allow us the time and space to work with how we can align in our rightful feeling vibration to attract what we want, each month, a New Moon opens a waxing phase of initiating energy favoring creation until we reach the Full Moon, opening up a waning phase allowing for natural correction, reflection and release. LunarOScopes capture the forecast of these cycles indicating what is meant to begin or conclude, timing when and what specific area of life our Sun Sign benefits by turning our feelings into intentional thought. Of course this generalized view provides one part of our soul story focus, while examining our natal chart -cast from our full date and time of birth- provides us with our personal and deeper dish details. Waning Phases favor to let go, review, redo, and heal energetically throughout one half of your Zodiac Pie from 0 degrees Gemini (the first of 5 Full Moon’s to fall at this poignant degree point through March 2019) through Cancer, Leo, Virgo, Libra, and Scorpio until the last New Moon of Autumn as well as 2018 arrives 07 December at 15 degrees Sagittarius. This last Full Moon of Autumn is extremely involved in communicating plenty of transformation tones which is part of the conclusive work 2018’s theme of Feeling the Feminine has been asking for us to integrate into our lives all year long. There is a driving force asking us all to recognize the power of change versus resisting it, as well as the means to find the up side of what a healing force can be all about. As we practice optimism to open the doors to redefining what the truth really means, we can equally see possessing a growth mindset is what serves us to know the soul work we are doing is worth the effort, so our future is set up for thriving success. Remember as the 0 degree point represents not only rebirth and profound life cycles in absolute shift, we have to truly let go in order for it to work with us versus against us. This number is extremely important to understand and assimilate into our healing for the next few months. 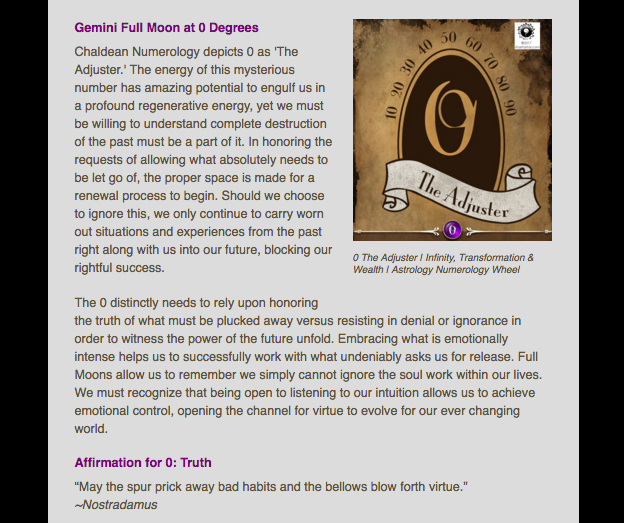 0 is The Adjustor, the regenerative energy that asks us all to distinctly surrender the power we give to the past, in such a way that it becomes destroyed, and most certainly provokes a potent and intense emotional process as we do so. This is an undeniable time to allow our light to become reborn into a fascinating force for the future whose process is completed upon the Spring Equinox 2019. 2018’s 12th Full Moon. Where are you being asked to be Optimistically Opening The Truth, Dear Star? ARIES: It’s time to focus upon release with how I Communicate, relating to your thinking, mentality, mindset, siblings and neighbors. It is extremely important that you remain teachable, so retreat to solitude, listen carefully and absorb the silence. TAURUS: It’s time to focus upon release with what I Have, relating to your income, values, possessions and overall sense of security. Continuing research is required concerning your wealth, which seeks an active future for it to flourish. GEMINI: It’s time to focus upon release with who I Am, relating to your appearance, emerging self, and the mask you wear to the world. Patience is especially required with your partnerships and see what you can learn from them about your career. CANCER: It’s time to focus upon release where I Process, relating to your solitude, retreat, inner work your subconscious and dream state. Revisions carry on for your habits and routines, plummeting you to reveal a deeper truth about what you believe. LEO: It’s time to focus upon release where I Socialize, relating to your future goals, aspirations, friends, groups, peers and ultimate hopes and wishes. Reconnecting with children and creative adventures has undeniable wealth to share with you. VIRGO: It’s time to focus upon release where I Structure, relating to your career, public and professional life and views upon authority. What you are doing to reestablish how you nourish your home and family life continues to heal your closest relationships. LIBRA: It’s time to focus upon release with what I Believe, relating to your willingness to be educated, abilities to grow, stand in your truth and express your philosophies. The power of positive thinking will not fail you now, so be determined to make this a habit that will stick. SCORPIO: It’s time to focus upon release where I Transform, relating to your wealth, sexuality, abilities to transform, regenerate and change. Keep researching ways to bring more value into your income, which should include how your creativity can support you. SAGITTARIUS: It’s time to focus upon release where I Relate, connecting to your partnerships, legal agreements, business and personal relationships. As you continue to redefine the face of who you are to this world, you are motivated to nurture your home life for the better. CAPRICORN: It’s time to focus upon release where I Serve, relating to your habits, routines, service to self and others, and your physical health. Dive deeper into your solitude and retrieve the power of what you can process, which ultimately changes your frame of mind. AQUARIUS: It’s time to focus upon release where I Create, relating to your brain children, manifestations, physical children, love affairs and pleasures. Revision of your social scenes and future goals gets more serious, and the value you are meant to receive is priceless. PISCES: It’s time to focus upon release where I Nurture, relating to your home, family, closest environments, psyche and paternal energies. As life is showing you what needs correction within your career, remember all you can do to dynamically change up your approaches to life. What’s your Personal Forecast say for this Gemini Full Moon from your natal chart? BOOK NOW and schedule your private session with Sharita! Waning Phases favor to let go, review, redo, and heal energetically throughout one half of your Zodiac Pie from 11 degrees Gemini (the 1st of a series of 4 Full Moons to fall on this emotional degree point), Cancer, Leo, Virgo, Libra and Scorpio until the last New Moon of Autumn 2017 arrives 18 December at 26 degrees Sagittarius. This final Full Moon of Autumn 2017 is filled with tension without an outlet to grant it a proper foundation to find an ideal strength within its’ promised challenges. Equally it brings forward -under the station of Mercury Retrograde that commences only 8 hours before it peaks- a completely divided energy that seeks for us all to find our deepest means to emotionally respond verses react to what deceptive situations may appear as obstacles that will surround us. More than ever for any Mercury Retrograde or Full Moon this year, we are highly advised to utilize caution, mindfulness, and carefully listen from within for our answers to avoid potential outcomes of stagnation and restriction. ARIES: It’s time to focus upon release with how I Communicate. Refreshed thinking allows you to look at the brighter side of your peace of mind. Honor reflection now for your mindset- great benefits are received from writing things down. Taking time in solitude will assist you as you equally will receive information that helps you to redefine your truth and beliefs. TAURUS: It’s time to focus upon release with what I Have. Surrender now to fully let go of possessions and material things you no longer need to value, which may be a source of how you receive your income. Reflection will also call for you to reassess what you want for your future, as you decide to not resist a profound process of rebirth that resets your wealth. GEMINI: It’s time to focus upon release with who I Am. Time to take off the old mask you have been wearing to the world, erase your impressions of it, as you alter your appearance. As tired approaches to life exit, you are equally working with recharging the structure of your career, which will connect to what you need to work out with your partnerships. CANCER: It’s time to focus upon release where I Process. Honoring your solitude and working within allows your intuition to benefit now, while important messages may also arrive from your dreams. Connect the dots to recognize how your ultimate truth and beliefs seek for you to work smarter with how you serve your habits and routines to the fullest. LEO: It’s time to focus upon release where I Socialize. Opportunities to refresh and reset focuses attention upon friends, groups and your future hopes and wishes. Say yes to any spontaneous invitation from your groups or peers, allowing you to experience a powerful rebirth that has everything to do with what you do with children and your creative nature. VIRGO: It’s time to focus upon release where I Structure. Your career and public life resets its’ recognition and rewards, as responsibilities here now draw upon conclusions across the board. Be aware of taking your time to listen carefully to your close relationships, especially the special ones that you nurture the most within your home and family life. LIBRA: It’s time to focus upon release with what I Believe. Philosophies, beliefs, spiritual values, or learning adventures ask you to seize this opportunity to reboot their synthesis. As long journeys or travel call for your attention, recognize the ways your habits and routines are shifting that are asking for your communication skills to be directly involved. SCORPIO: It’s time to focus upon release where I Transform. Rebirth allows you to recognize genuine wealth is not just the luxury of your overall financial picture. As conclusions arrive from the depths of your core to ultimately regenerate here, you are positioned to focus upon your creativity and children to see the secure value they really are able to provide you. SAGITTARIUS: It’s time to focus upon release where I Relate. Reconsideration of your partnerships -business or personal- and the realization of who stands by you in non-deception now determines who stays. No matter the outcome, recognizing what is meant to be listened carefully to on your home front demands for you to change up your entire approaches to life. CAPRICORN: It’s time to focus upon release where I Serve. Reflective and renewing light shines upon your habits, routines and service to self as well as others. Taking time to really listen to what no longer truly serves you, allows you to reveal a more intuitive way of communicating, as you find yourself taking necessary time away from the world to process it all. AQUARIUS: It’s time to focus upon release where I Create. Look to completing current projects as creative conclusions are here, whether these be with children, brain-children or old love affairs. Enhance the light you shine upon your stage by embracing the value of listening more to the genuine value and security in your life that speaks the most to your future goals. PISCES: It’s time to focus upon release where I Nurture. Allow your imagination to flow within your home and family life, involving some literal cleaning up around the house. Listening to any déjà vu is extremely important, especially what emerges about redefining your appearance to the world and how you emerge in it, directly involving your career. 03 to 22 DECEMBER to Align Your Peace of Mind! ORDER YOUR TAKE AT HOME WORKSHOP TODAY! Where Will You Feel Release and Conclusions? Do you know your Sun Sign? This is all you need to begin to read on and see where the Full Moon is bringing a reflective feel to your life. Remember if you know your Rising Sign (Ascendant), read that passage too for a deeper look, for it typically will apply to your personal charts’ advice from the natal perspective. However, it is wise to consult a professional astrologer to read the accurate analysis of your individual natal chart for the precise area of life where 25 degrees Gemini affects your personal zodiac pie. Those in full awareness of their natal birth chart will wish to check any planetary placements that are placed near the 25 degree points, for these areas of the life will equally receive a channel as well from our 25 degree Gemini Full Moon, asking to connect more clues as to how letting go will call loud and clear. Remember with all Full Moons, look back to what was initiating in this area of the life 6 months ago upon the New Moon here, and see what is now coming to a sense of completion. Both your sun sign and rising sign (ASC) perspectives are the two areas of your life that call for you to welcome release and conclusions within the next two weeks to follow. Properly embracing letting go until the next New Moon upon 01 January 2014 will make the appropriate space for the new to be planted later. Aries: Thoughts now can be properly placed into a conclusive mental focus that you have been working towards since June where I Communicate. While you are no stranger to striking up ideas, many you have had now come full circle. Take time to consider a short trip if you aren’t already on one. You may find your siblings require your attention at this time, but be sure not to react to them, simply respond. As you are about to review the value of your career, you may see some clues hinting what you truly feel here. Taurus: Your possessions are always of great value to you, but it is time to part with some of what I Have. How you earn your dollars finds conclusive avenues to flow from that saw their birth back in June. While you cherish that deep sense of solidarity and security, logic naturally enters the situation as you honestly ask yourself, what does the material mean to me? As you are about to review the value of you beliefs and philosophies, this lunation grants the channel you need to recognize what you feel about it. Gemini: As this extra boost of Lunar spotlight shines ultimately upon your ability to reflect, be ready for witty, liberal, and self-oriented feelings to accompany your normal improvisational approach to how I Am. All that has flowed anew from June now completes. As your first impressions find the channel for release, fully commit to taking this time to re-activate the self. You are about to get the review and redo in what wealth means to you, so make sure you listen for processes that can help you transform even more. Cancer: You won’t mind going into some deeper waters and take the Crab on a dive into those inner places in your life where I Process. Record the messages from your night-time dreams. Romanticizing about the past allows a subconscious discovery to unfold. The spiritual, inner realms, and the psychological make-ups of life call to you. There is a request coming to take time equally and explore the value of all your one and one relationships- make sure any worries here are shifted to concerns. Leo: Your friendships and organizations take focus and attention where I Socialize. You already sense what no longer works here, as conclusions are drawn. If there is a group or cause you’ve been thinking about releasing, cast them out of your royal court. Accept that unexpected invitation to socialize, for there is equal emotional satisfaction you’ll gain. All the ways you provide service to this world are about to go under a period of review, and this leads to routines and habits that will change within your groups. Virgo: Harvest, stability, and rewards await results within your career and public life, so this is no time to be shy where I Structure! A project comes to fruition, or a recent job may come to an end. Your relationship to authority requests you reflect upon what you’ve not been responsible to up till now. Equal review time calls in regards how you creatively put it all together in life, so look to how more solidarity can be captured to bring your place in the public eye to more perfection along your journey. Libra: Conclusions arrive where you have been taking your philosophies on since June with all I Believe. A long trip to balance those Scales brings comfort by reflecting or planning one, and you equally aim to find ways to broaden your view of the world at large on some kind of educational pursuit. Somehow, what is about to really start a passage of examining in the value where you nurture and what goes on within you home and family life will lend a strong hand to help what those beliefs are all about. Scorpio: Your securities and investments, ask for your time to reflect upon whether these have been for the best or not where I Transform, as the focus shines upon your entire place of wealth. No stranger to turns of regeneration, you’ll find there is another pass that your innate abilities here will find to complete, and this strengthens your core like never before. Look to the true value of what you’ve been thinking, and you’ll also discover a new strength that is available to you to regenerate and release, responsibly. Sagittarius: Your partnerships will be on your mind, from your romantic ties to business contacts where I Relate. What needs to conclude and move out of the way here from June’s new beginnings? You’ll find people you have been connected with that will not remain in the future picture. Aim your arrow to stimulating conversations that captivate your interest, which tend to be concerned the past. All makes solidarity arrive with what you have, which is about to go through a serious reflective period. Capricorn: While your world is practically perfect Old Goat, there are things that ask to conclude in regards to your health and how you bring your impeccable perfection where I Serve. Old routines and habits find the exit doors, especially the ones too tired to keep up with your ambitious pace. As you are truly about to reexamine all that you are in your approaches to life- these first impressions grant the clues of how to change and let go what you no longer need to be of service to this world. Aquarius: Conclusive light that brings full illumination to where I Create. Whatever project you’ve been inventing and stimulating since June wishes to be brought to fruition. While plenty of playful feelings and opportunities to socialize are around, your children, or “brain children” may ask for your ultimate attention now. A love affair may fall out of the larger picture. This may take some time hanging out within your inner process for the stunning answers, which is going to request you patiently listen now. Pisces: Get out of the waters and clean your house Dear Fishes where I Nurture! The home environment requires your full attention from June’s initiations. A whole different point of view surrounds the family life, and one that may see necessary conclusions. Appreciate and fine-tune your psychic abilities to the déjà vu experiences surrounding you: important messages can be received. Look to where you socialize to connect to ways that assist you further, as you gear up to know what groups mean the most to you. Energy completes and releases within this half of your Zodiac Pie throughout 01 January 2014. Moon VOC: When the Moon makes its’ last major aspect to a planet before entering the next sign, it is a recognized time that strongly advises us to not be in forward motion nor make any important decisions for the future. As we welcome our last waning moon of autumn and for 2013, as our Full Gemini Moon opposes our Sun at 25 degrees Sagittarius, we will be asked to hold off and remain in pure reflection and review until it enters Cancer. Allowing Chaldean Numerology to assist us further in knowing more ways to guide our energy properly, tells us this is indeed a lunation that asks for our careful observation and discern for what we see. With the natural properties of Gemini equally being similar, this lunation deeply asks for less talk and much more listening. While any Full Moon casts the energy off for a completely reflective feel, at this degree point -once more as it was upon both October’s and November’s Full Moon- we have one more request to truly take time in solitude and work within our inner processes that will be of extreme benefit where 25 degrees Gemini personally affects our lives. As always, in our SILENT LISTEN, what we can examine will lead us to the answers that guide us to innately know what we must release.